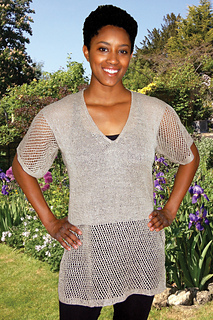 This one-piece, top-down tunic has lace sleeves, deep hem, and left and right side panels that are worked in an easy 4-stitch, 4-row eyelet lace pattern. 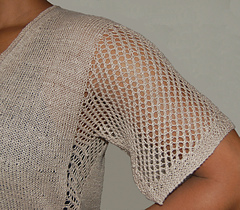 The back of the tunic and the back of the sleeves are worked together. 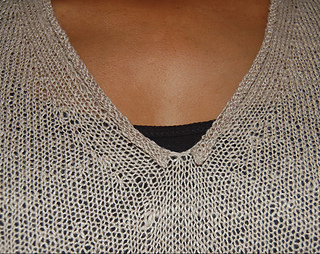 The right front and right sleeve are worked together, as are the left front and left sleeve, which are then joined to form the V-neck. 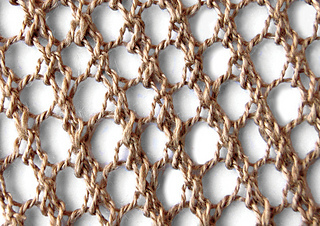 The V-neck has a rolled Stocking stitch edge. 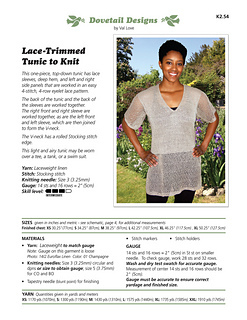 This light and airy tunic may be worn over a tee, a tank, or a swim suit.